If you’re a first-time entrepreneur, there can be a lot of confusing financial jargon to deal with — especially when you’re raising funding. If you don’t want to get screwed, some things are worth fighting over, but others probably won’t make a difference. Which is which? You can find plenty of viewpoints online, but now Y Combinator-backed startup SmartAsset has released a Startup Economics calculator, which shows you exactly how each financial decision can affect the money you make when you sell to Google (or, you know, whatever). The calculator basically takes you through each event that can affect the division of a company’s equity. 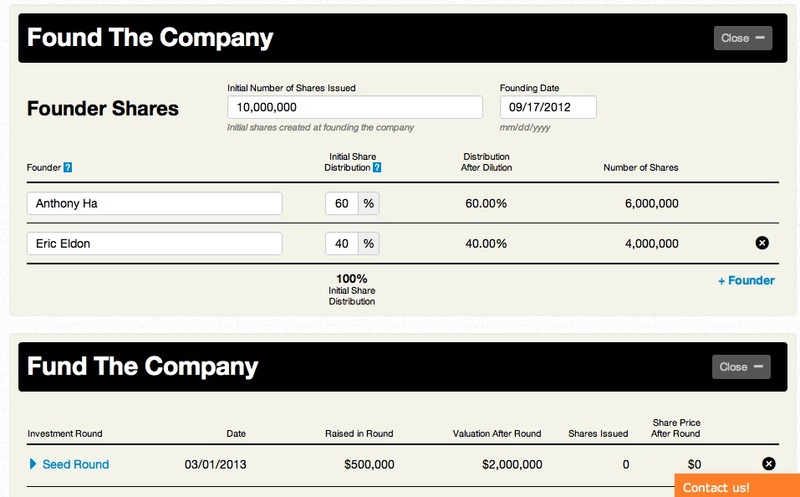 First you start with the founding — entering the total number of shares, each founder, and the equity that they receive. Then you enter employees and advisors and their equity. You can add multiple funding events and their details, and the eventual exit. Some of this, of course, is fantasy math. When you’re raising a seed round or a Series A, you don’t know when or if you’re going to be acquired. But that acquisition is when questions like valuation really come into play, and when all that negotiating you’ve been doing hopefully pays off. SmartAsset helps you understand that ultimate financial outcome, displaying how much each party would make off a given deal, and, more importantly, how changing the terms of the deal would affect how much you make. For example, SmartAsset co-founder and CEO Michael Carvin says the calculator illustrates that trying to increase an $18 million valuation to $20 million probably won’t make a big difference, while the liquidation preference might. The calculator, Carvin says, was really just a side project, not part of SmartAsset’s core home finance product (with other financial products to come). However, both projects come from real problems that Carvin faced — first, buying a home, and more recently, trying to understand the intricacies of raising funding. (SmartAsset just raised a $900,000 seed round from Y Combinator, Quotidian Ventures, and various angels.) The team built its own calculator, and as with the home finance product, it realized that others might find use for it, probably starting with SmartAsset’s fellow YC companies, who just presented to investors at the incubator’s latest demo day.